Minorca is one of the best condo communities in the pristine beach town of New Smyrna Beach. With the Atlantic Ocean on the East side of these condo buildings and the inter-coastal waterway to the West side, this community offers breath-taking sunrise and sunset views. The Minorca community was built on 65 acres and is 15 miles south of Daytona Beach. New Smyrna Beach is the closest beach town to Central Florida’s theme parks being only an hour from Orlando. 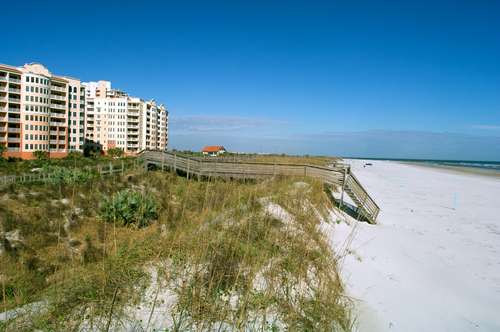 Adjacent to this fantastic community is the Smyrna Dunes Park that offers 220 acres of park with over four miles of boardwalk and walking trails. The first of the 7 Minorca buildings were completed in 2002 and the last in 2006. The property includes 310 condo homes. Minorca offers an exclusive clubhouse complete with a full kitchen, bar, pool table, and entertainment area; a large heated pool and spa along with a fully equipped gym with a sauna; tennis courts; 24/7 staffed security gatehouse; Ponce De Leon River Pavilion; excellent on-site management staff; boat docks for rent or purchase; and fishing docks overlooking the New Smyrna Beach Coast Guard Station and Ponce Inlet Lighthouse. Currently the lowest priced condo in this prestigious community is a second floor, 2 bedroom, 2 bath, 1,450sq ft unit listed at $347,000 and the highest priced condo is a seventh floor, 4 bedroom, 3 bath, 2,620 sq ft unit listed at $1,550,000.